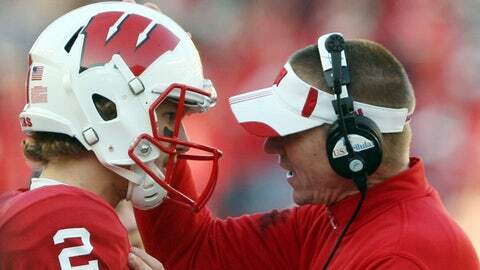 In his first year at Wisconsin, Gary Andersen (right) has the Badgers on the verge of another 10-win season. ORLANDO, Fla. — All the ingredients are the same: Sunrays, palm trees, warm weather, a date to end the season on New Year’s Day. The elite-bowl lifestyle has become old hat for Wisconsin, even if this Sunshine State stage to ring in 2014 has a different feel than the California dreaming of recent years. This is the Capital One Bowl, not the Rose Bowl, which became the Badgers’ January outpost the past three seasons. This is Orlando, not Pasadena, a college football paradise tucked near the San Gabriel Mountains that glitters as the goal of all Big Ten Conference dreamers who let visions of red petals dance in their heads. This is central Florida, not southern Califonia, and although the zip code falls outside BCS land, there remains a reward to be earned. "I don’t have a feel for that, so I would say that’s a very good thing," Wisconsin’s first-year coach Gary Andersen said the day before his team plays South Carolina, when asked if he has noticed differences in how veteran players have approached this game compared with the Rose Bowl. "I’ve been fortunate to be at a few bowl games, been on big stages just like this one is, and it’s first class through and through. And I imagine that’s how the Rose Bowl is. I know that’s how the Capital One Bowl is, and our kids have had a great time." 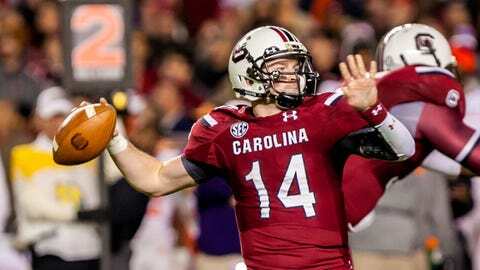 FOX Sports Wisconsin takes a closer look at South Carolina and what Wisconsin will have to do to win. "New" has been the operative word for much of Andersen’s season. New comfort for his program, after former coach Bret Bielema bolted for the SEC in December 2012. New comfort for Andersen himself, after athletic director Barry Alvarez tapped the then-48-year-old to lead the Badgers following four seasons at Utah State. It’s fitting, then, that Florida provides a what-is-old-is-new-again feel for Wisconsin as it prepares to close Chapter No. 1 with Andersen. This is the Badgers’ first trip to the Capital One Bowl since the 2006 season, their third visit to this event all-time. — In January 2006, during Alvarez’s final game as coach, running back Brian Calhoun racked up 213 yards on 30 carries with one touchdown in Wisconsin’s 24-10 win over Auburn. — In January 2007, Wisconsin topped Arkansas 17-14, despite being out-gained 368 yards to 201 and committing three turnovers to the Razorbacks’ two (the victory marked the first time the Badgers won 12 games in a season). "It’s a real privilege and honor to be competing in this bowl game in our first season at Wisconsin," said offensive coordinator Andy Ludwig, who spent the last two years at San Diego State. "Everything is new. Everything is for the first time." New regime, same expectations. The Capital One Bowl — about 2,500 miles from Pasadena’s pomp and pageantry — offers a unique opportunity for Andersen and his staff to end the first season of their new lives in impressive fashion. Beating Steve Spurrier’s Gamecocks, in the state where the Ol’ Ball Coach made his legend, would mean a number of notable achievements for a growing vision. It would give Wisconsin its seventh win in its last eight games, 10th overall, marking the program’s fourth season with double-digit victories in the past five years. It would give Andersen his second consecutive season with at least 10 wins, joining the 11 he had with Utah State. The most delicious part: It would plant a flag in unfamiliar ground for the Big Ten, which is an anemic 44-26 against the SEC in bowl games since 1977. Beating South Carolina, the program of NFL-star-in-waiting Jadeveon Clowney, would be a fine way to cap a season of firsts. "Coach Andersen has been great," wide receiver Jared Abbrederis said. "Having an additional head coach is different, but the change has been really good. So for me, I think he just brought back the fun in football." "I think Coach brought a lot of energy to the program, really revitalized a lot of guys’ take on the game, and it’s also been a great relationship to have as a player to the coach," linebacker Chris Borland said. "He really cares about you and reaches out to you more than you’d expect." Outside the BCS Championship Game, relationship-building is what these bowl games are about, when all the parades and television packaging are stripped away. This Orlando trip is another chance for Andersen to bond with his team — he tried to create a user-friendly schedule that balances work and play — and continue to establish habits that could reap rewards next year and beyond. There’s a larger goal, or at least there should be. Florida, not California, will be the site of the Badgers’ final snap on New Year’s Day this time. But aside from differences in the events’ tradition and perceived prestige, the Capital One Bowl offers the same fundamental benefits that life did under southern California’s sun: A chance to come closer, a chance to grow as a program, a chance to reflect on the good from all the sweat and sacrifice from the previous three months before building for another season. "Our kids have had a tremendous opportunity to have some valuable memories and that is a key in coming to a bowl game," Andersen said. "Being prepared is obviously important. The game is the biggest part of this. But to be able to have some memories, going to places where kids get to go once in a lifetime … a lot of memories (have been) taken in a real positive way. So it’s been a great week." No Rose Bowl? Save Granddaddy’s breath. These Badgers are fine on the opposite coast, after trading Rodeo Drive for Mickey, La-La Land for the place where dreams come true. "It’s first-class," Andersen said. "Our kids, I know, feel that way."